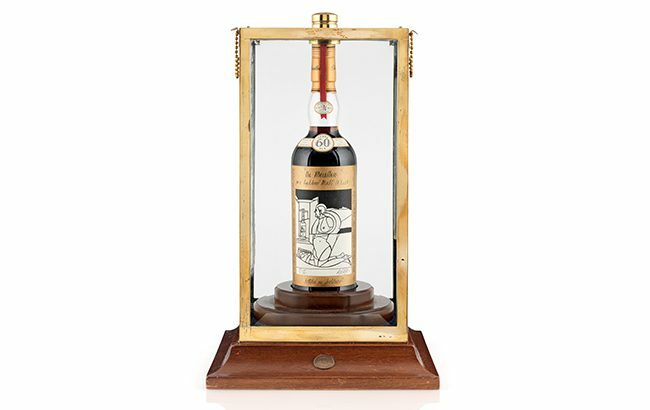 A 60-year-old bottle of The Macallan Valerio Adami 1926 is expected to sell for up to £900,000 (US$1.14m) when it goes under the hammer in Edinburgh. The expression is estimated to make between £700,000 and £900,000 (US$888,000-US$1.14m) at the Bonhams Whisky Sale on 3 October. Bonhams claims this could break the world record for most expensive bottle of Scotch sold at auction. The whisky was bottled in 1986 and Macallan commissioned Peter Blake and Valerio Adami to design the labels for the limited edition bottlings – 12 of the Adami and 12 of the Blake labels. Earlier this year, a bottle of The Macallan Valerio Adami 1926 sold at a Bonhams auction in Hong Kong for £814,081 (US$1.1m) – the most ever paid for a bottle of Scotch whisky at auction. It is not known how many bottles of The Macallan Valerio Adami 1926 still exist. One is said to have been destroyed in an earthquake in Japan in 2011, and it is believed that at least one of them has been consumed. Bonhams whisky specialist, Martin Green, said: “The Macallan 1926 60-year-old has been described as the Holy Grail of whisky. “Its exceptional rarity and quality puts it in a league of its own, and the world’s most serious whisky collectors will wait patiently for many years for a bottle to come onto the market.